For their successfull intention of thinking good, being good and doing good. Three things can not hide for long: The sun, the moon and the truth. Many Buddhist temples in Thailand, Laos, Burma and Cambodia show skillfull paintings all over their walls and ceilings, inside and outside. 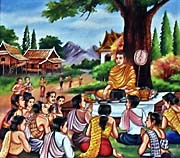 Most of what is described in them depicts the Life of Buddha. That means not only his last life, what is the life of the historical Siddhartha/Buddha, but it also includes the supposed 500 lifes Buddha lived before becoming the Buddha, the 'enlightened' one. In these former lifes he appeared in the most different personalities, sometimes as animals, sometimes as a human in different roles. In one of them he is even a robber. 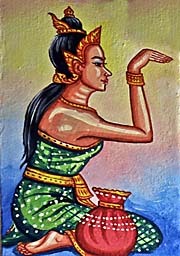 But not only that, here and there are also local sagas and spirits included in the temple depictions. It's also obviously that Buddhism in these countries is strongly influenced by the preceding religion in Southeast Asia, Hinduism. Many Hindu figures appeare in the temple paintings and statues around, like Ganesha for instance, the Hindu god for wealth. 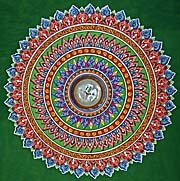 The Hindu legend of the Ramayana is reflected in many of these paintings. Buddha's life and his teaching wouldn't be understandable and convincing at all without the kind of life which he had chosen to live. According to the records he lived the life which he was teaching. Since Buddha didn't write anything about his life and doctrine, and his fist disciples didn't either, what we know about his life started as an oral record, told from disciple to disciple, from generation to generation. It ned some 300 years until the biography and teaching were written first. 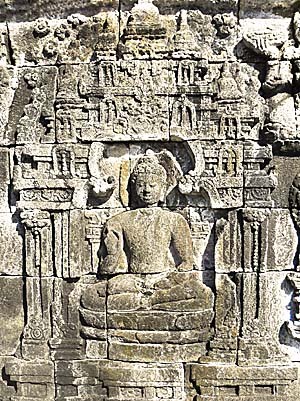 Considered Buddha was a real living historical person, what he was probably, and not only an invention of a certain group of people. That let's us question about what are historical facts and what are exaggerations, imaginations or distortions of Buddhas story. To make it short, there is no chance to find that out anymore. The best way to approach Buddha and Buddhism is, as I see it, to study carefully his lifestory and teachings and to reflect it critically by it's meaning. 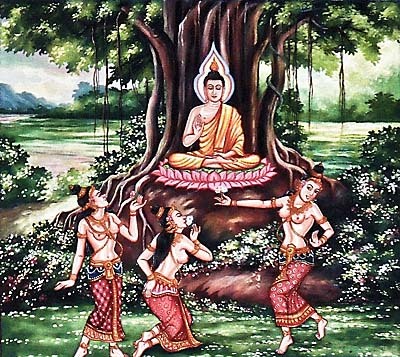 Nevertheless, Buddha's story is full of supernatural appearances. That is up to the believers to believe; a critical mind of the modern age should see it as what it is: additions to the lifestory of a person, made with the intention to impress pre-modern people and the simple minds. 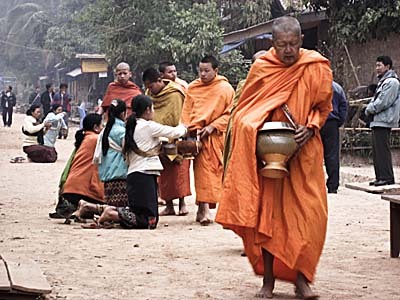 Buddhism, as religions in general, divides in two spheres, so to say. There is a philosophical teaching, what is concerned to the earthly life, and there is a transcendent part, what is focussed on what's beyond humans life, mostly the afterlife and the power of gods, ghosts, spirits etc. Every religion's claim is that the earthly life and how it is led has strong consequences for the afterlife. Since there are ten of thousands of different religions on earth, and they all claim they would have the only valid answer for the transcedent part and therefore for what's right and wrong on earth as well, it's a pretty weired situation. If one is right, all the others must be wrong. The contradictions between the different religions are to big. Moreover, there are no proofs, no hard evidences for any of the transcendent and supernatural claims of any religion. It's, again, up to the believer to believe. Believers neglect critical reflection; they want to believe, because they find comfort in their belief. To believe means literally not to know. Critically questioning the belief is for them a threat for their very orientation system. If the belief is maybe not valid, they have no idea anymore about what's right and what's wrong. Life is without meaning, as it seems then. That's a reason why believers tend to react pretty harsh in case their faith is questioned. In the 19th century the western reception of Buddhism was that of an inferiour, primitive superstition. That was still a time in which the western religion, Christianity, was made up as a legitimation pattern for colonialism. That changed in the 20th century. Buddhism got better understood and became attractive for a growing number of Westerners. Particularly after the political movement of the 1960s failed to overcome capitalistic society in the west, many young Westerners refuged mentally into weired sects, superstitions and beliefs of many kinds. One particularly attractive became Buddhism. That was certainly so for the philosophical core of the Buddhist doctrine. 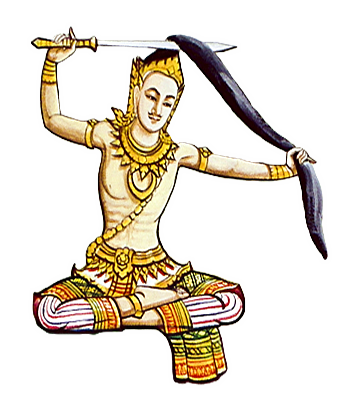 Another attraction in Buddhism lies in the fact that Buddhism was never so much a martial religion as Islam and Christianity. Buddhism was much less involved in war legitimation. 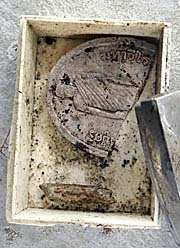 Very much of Buddha's lifestory will have been invented or changed in any way. After some 300 years of oral transmission, Buddhism became an organized religion. Institutionalized. King Ashoka in India made it his state religion. From then on it was at the latest a mean of power. 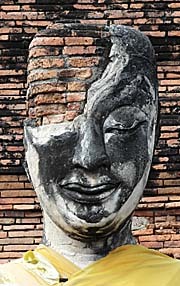 But even in Buddha's time Buddha savored protection from a local king. In which way he and his teachings in his lifetime were involved in politics - the sources tell us nothing about that. However the reception of the Buddha is, one thing is clear: Buddhism is also a practical religion, and meditation is a basic concept of it. And meditation is concentration. Concentration is the contrary to what surrounds us most of the time in modern life: entertainment and advertisements, stress, pressure and noises, what is distraction. 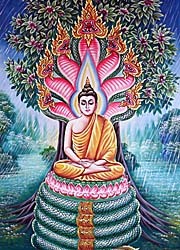 Basically Buddha's life had three distinct phases: The young years as a prince, when he eventually was realizing human suffering, than the search for an absolute way of overcoming this suffering, and finally the fullfillment of his search and the commitment to spend the rest of his life by instructing others to achieve enlightenment for themselves. Buddha's mother had once a dream of an elephant. The elephant (actually a white one) ripped her belly with his ivory tooth. This is said to cause a pregnancy of which prince Siddhartha followed. 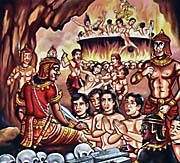 Short after his birth Siddhartha is already fully able to speak and starts preaching. He also utters predictions of his future life. 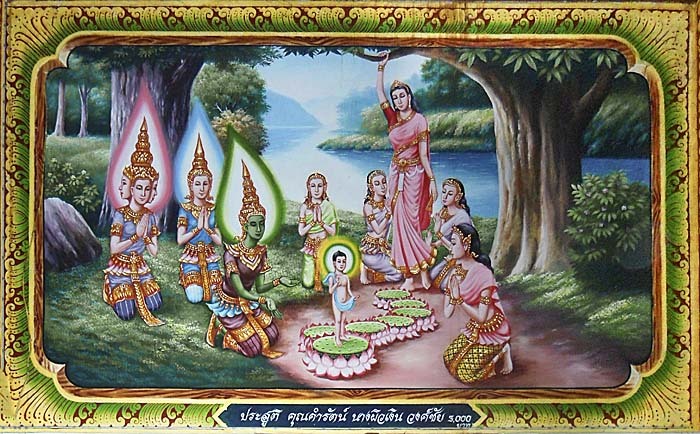 In the background, upright standing is his mother, kneeling around her four servants and left in the picture are three supernatural beings, attracted by the event. The person we know as Buddha was born as the son of a local king (or chieftain) in the Lumbini grove, near Kapilavatthu, close to where the border between India and Nepal is nowadays. His birth happened in the time around the sixth century BC. He was called Siddhartha Gautama (Sanskrit; Siddhartha means 'One, who achieves his goal'). 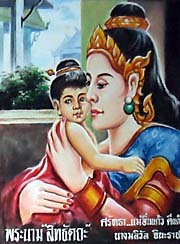 Little is known about the early life of prince Siddhartha. His father was the wealthy leader of a small tribe called the Sakka. His mother died a week after his birth and Siddhartha was raised by his aunt, who became his father's second wife. Probably he was grown up in prosperity and received a good education by the standards of this time. He had the reputation to be physically extraordinary attractive. In the age of sixteen he married a women with the name Yasodhara. Much later, when he was already 29 years old, they got a son, Siddharthas only child, so far we know. 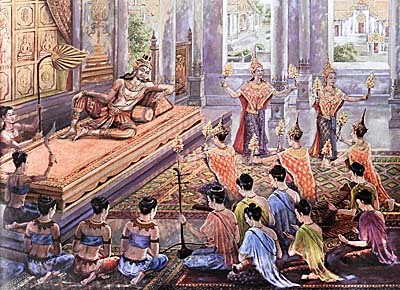 Siddhartha lived certainly a comfortable and screened life, mostly in the palace surrounding. It's said that his father kept away anything from him what had to do with decay. Nevertheless, he noticed that people grow old, get sick and die. He concluded what everyone finds out once: there is unavoidable suffering in the world. He wondered: What is the reason for the suffering? What is it's meaning, and can it be overcome? Later Siddhartha saw a man who had left his home, a man with a shaved head, wearing yellow robes. He was seeking for a life of wisdom, virtue and tranquillity outside the conventional life of society. This impressing event let grew Siddharthas decision, to follow this example. In the age of 29 years he shaved his hair and beard, put on a yellow robe and left behind him the luxuries of the palace life, going into homelessness. The following part of his life would last six years, until he reached a state of consciousness what is called 'enlightenment'. Siddharta startet his search for answers by joining the persons who were in the reputation of being wise. That were, in his time and surroundings, the Brahmans. Brahmanism was a forerunner of Hinduism, based on an oral teaching known as the 'Vedas'. It's interesting to see that in this time meditation and yoga techniques were already regarded as an important spiritual discipline. 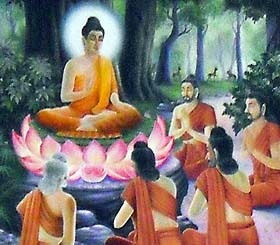 Siddhartha impressed two of the leading Brahmans with his quick understanding of their teachings and meditation practices, but remained unsatisfied about the outcome. This teachings finally, he said, "do not lead to disenchantment, to dispassion, to cessation, to peace, to direct knowledge, to enlightenment, to nirvana". After departing from the Brahmans, Siddhartha met different teachers with different philosophical teachings like Jains, who opposed every form of violence, the Ajivikas, who were fatalists and claimed, that human lifes were predetermined and beyond our control. There were others who denied any afterlife beyond this one. Siddhartha, coming in contact with these different ideas, lived a time of spiritual unrest. Finally he joined a group of five Samanas, who practiced a strict asceticism. Buddha, starving and meditating. In the background the five Samanas. 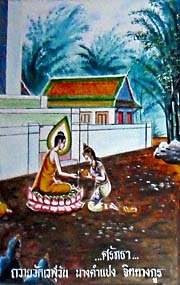 Sujata is offering food for Siddhartha. 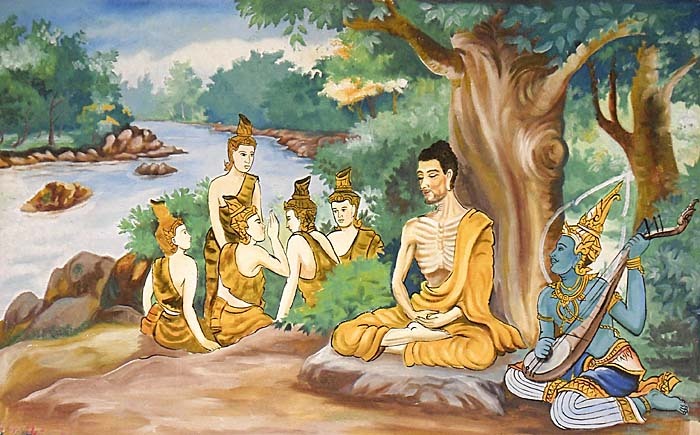 Siddhartha followed this way, starving almost until the point of dying. But, after years, he still could not find that this way would lead to his goals, overcoming suffering and reaching enlightenment. He thought, there must be another way to enlightenment, and he started to eat food again, provided by a young woman named Sujata. His five Samana companions left him, disappointed that Siddhartha reverted to live a 'life in luxury', as they saw it. Now nourished, Siddhartha began to reflect and meditate while sitting under a bodhi tree (awakening-tree), still determined to achieve enlightenment, but now by his own. In this situation appeared a final obstacle. 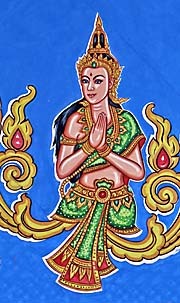 Mara, the personification of the evil (comparable to the devil in Christianity), tempted Siddhartha with visions and promises of sensual enchantments, later also with the threat of physical torments. Siddhartha resisted against it all, and Mara now questioned his believe in enlightenment. Siddhartha held firm, claimed that he was spiritually well prepared now for enlightenment and touched the ground with his right hand to bid the earth to bear witness to his claim. The earth shook and Mara was defeated and fled. Next Siddhartha passed through four levels of concentration. His mind was thereby purified, bright, unblemished and rid of imperfection. He realized specific knowledge of his own past lives. And he gained the knowledge of the nature of suffering, its origin, its cessation and the way leading to its cessation - what he would call the 'Four Noble Truths', the core of his following teachings. His mind was freed from sensual desire, being and ignorance. He had achieved enlightenment. 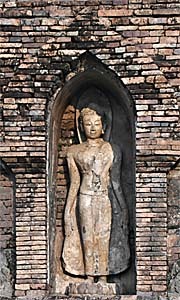 Siddhartha was now a Buddha, an enlightened one, who had rediscovered liberation from the cycle of rebirth and suffering. He was now 35 years old and would still live another 45 years. 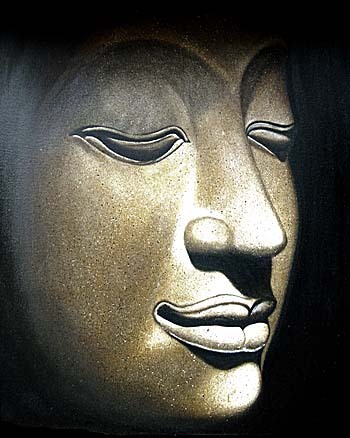 After the enlightenment the Buddha (the awakened) is not seen as still growing in wisdom or virtue anymore. 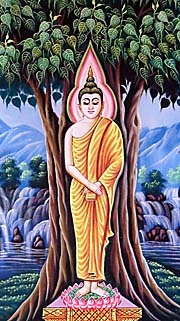 The transformation under the bodhi tree was thoroughly complete and radical. There was nothing for further improvement left. That's now typical for a religion: it's absolute. 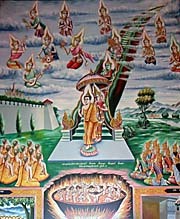 The Buddha now went back to his five former companions, the Samanas. First they were suspicious, because they thought Siddhartha were returned to luxury and for that could not be a truthful spiritual striver. The now Buddha explained them that it wasn't so, but that he had found enlightenment. It was here, that the Buddha started teaching, 'setting in motion the wheel of Dhamma'. It was focused on the 'Four Noble Truths', culminating in the 'Eightfold Path', leading to the cessation of suffering. The Buddha described it as the 'middle way', between the worldliness of most people and the strict asceticism of the Samanas. Soon in short order all five were convinced. They became fully enlightened as well and they were Buddhas first followers. Soon after that the Buddha attracted a large group of male disciples, called the 'Bhikkus' (commonly translated as monks). They had left their homes as well as the Buddha had, on the search for enlightenment, and together with him many of them found it. 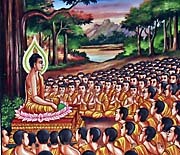 Buddha attracted increasingly more and more people; here he is teaching to a mass audience. Those in the background apparently couldn't understand a word anymore, but word certainly spread out mouth to mouth. Nowadays the Buddhist temples in Thailand use terribly noisy megaphones to boast out announcements of different kinds. They lived together in a highly disciplined, celibate community (called 'Sangha', standing for 'monastic order') and lived from alms. 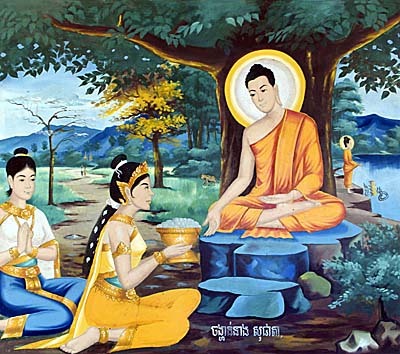 After five years, due to the urging of his stepmother Mahapajapati and his attendant Ananda, the Buddha also established a community of female disciples (the 'Bhikkhunis', what means nuns). Additionally to that there were also male and female followers, who didn't leave their homes, but also tried to live according to Buddhas teaching. The remaining time of his life Buddha spent travelling on foot in the area of the Ganges river basin, accompanied by many disciples, teaching to whoever would listen, irrespective of class or gender. In his eightieth year he was suffering an illness (possibly from food poisoning) and realized, that he would die now. Buddha didn't appoint a successor. He instructed the disciples to "live as islands unto yourselves, being your own refuge, with no one else as your refuge, with the Dhamma as an island, with the Dhamma as your refuge, with no other refuge". He also said to them that his teaching "should be thoroughly learnt by you, practiced, developed, and cultivated, so that this holy life may endure for a long time, that it may be for the benefit and happiness of the multitude, out of compassion for the world". In the night of Buddha's dead a wanderer named Subhadda asked to speak to him. He had a doubt he hoped the Buddha could dispel. 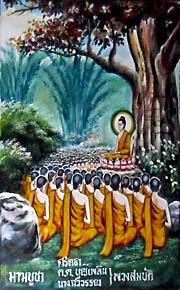 Buddha emphasized to Subhadda the importance of the Eightfold Path as the distinctive feature of his teaching. 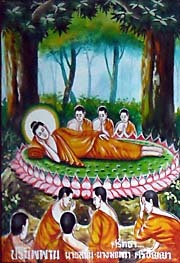 Subhadda became the final disciple of Buddha. Buddha addressed his final words to his disciples: "All conditioned things are of a nature to decay - strive on untiringly". 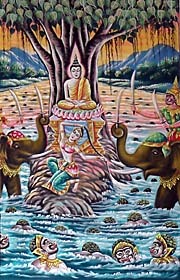 The last moments in Buddha's life. After this, Buddha passed away. As Buddhists believe, he went out to nirvana, nothing, as they believe it happens to enlightened people. He had overcome the circle of being reincarnated. Those disciples who didn't have overcome their passions wept, and tore their hair. But others, who were free from craving, endured mindfully and cleary aware, saying: "All compounded things are impermanent - what is the use of this?" As the Buddha had wished, his body was cremated seven days after his death on a stupa in the manner of a king.